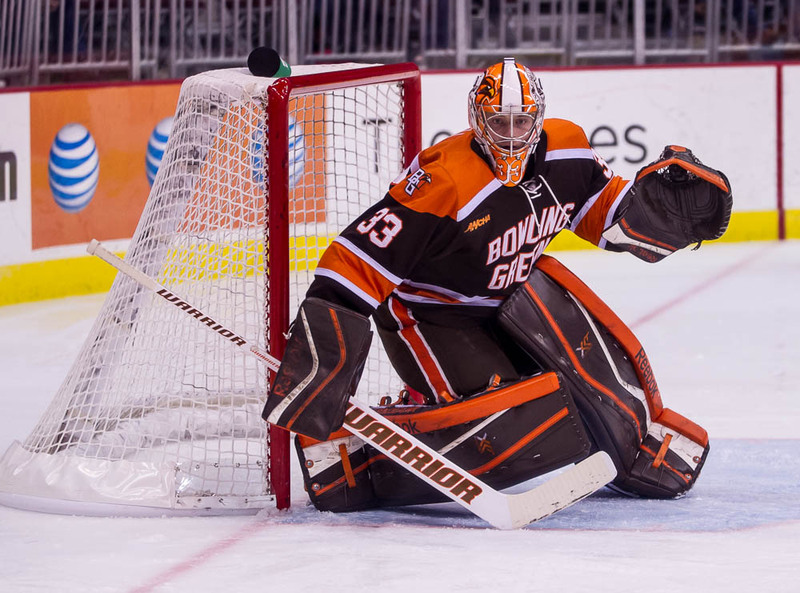 The freshman stopped 27 shots — including a penalty shot — to help Bowling Green to a 3-2 win over arch-rival Ohio State at Value City. Nell made 13 saves in both the first and third periods to improve to 3-0. His work in the first period enabled the 19th-ranked Falcons to survive a slow start and move to 8-3-1 overall. OSU had 14 shots in the first period, including three breakaways and a penalty shot, but the period ended in a 1-1 tie. The start was Nell’s first since Oct. 25 at Clarkson where he made 30 saves in a 5-4 win. He also stopped 20 shots in a 5-0 win Oct. 17 at Alabama-Huntsville. Nell had a tough finish at Clarkson, allowing three goals in the final 23 minutes. “It’s always tough not playing,” said Nell, who has a 2.00 goals-against average and a .928 save percentage. “The other guys are playing well. We all battle in practice. Our practices are game-like every day. The Buckeyes’ Tanner Fritz had the penalty shot after he was tripped on a breakaway by Mark Friedman. OSU had the option of taking the penalty shot or a two-minute power play. “That took all of the momentum away (from OSU). That kid is an absolute stud,” BG forward Brandon Hawkins said of his classmate. Fritz tried to fake Nell, who didn’t bite. Both of OSU’s goals came on deflections around the net. Nell also survived a hard collision midway through the third period with OSU’s Anthony Greco. The OSU forward charged into Nell as he took the puck to the net from the left wing. “To see him play the way we played tonight, it’s got to be a confidence boost for Chris,” BG coach Chris Bergeron said. THE STARTER: Nell earned the start after Tommy Burke played well Friday with 21 saves in 3-2 loss to OSU in the Ice Arena. Burke had started three straight games and has started six of BG’s 12 games. Nell’s start was his third, while Tommy Sholl also has started three games. “He hadn’t played in a while,” Bergeron said. “We wanted to give Burke a break, and (Sholl) had started three games and (Nell) two. DEFENSE: The Buckeyes controlled the first period with excellent offensive play that was helped by BG’s shaky defense. “Our first (period) wasn’t great,” Bergeron said. “A lot of those chances were big-time shots,” Bergeron said. The Falcons improved defensively over the final 40 minutes, limiting the quality and quantity of OSU’s chances. BG has allowed two or fewer goals in eight of their 12 games. “We were able to find our level of defending,” Bergeron said. “They had us baffled a bit. We were able to right the ship a little bit and defend the way we wanted the last two periods. We were able to close the door a little bit. STRONG FINISHES: The Falcons have outscored by their opponents by a 13-8 margin in the third period this season. BG is 6-1 when leading after two periods this season, and 2-0-1 when tied after two periods. The Falcons also are 5-2 in one-goal games. Hawkins scored to snap a 2-2 tie with just 2:40 remaining, only 47 seconds after OSU tied the game on deflection, the Falcons though was directed in with a high-stick. But the goal was allowed after video review. “It’s a gutsy win,” Bergeron said. INJURED: BG junior forward Ben Murphy left the game in the second period and did not return after getting hit in the leg with a shot. FINALLY: The Falcons snapped a five-game drought on the power play when Sean Walker scored with a two-man advantage at 17:32 of the second period. BG had failed to score on 18 straight power plays before Walker scored. The Falcon power play was 1 of 7 Saturday and 1 of 8 in the series, BG’s only power play Friday lasted only 36 seconds. PK: The Falcon penalty killing was 7 of 7 in the series, including 3 of 3 Saturday. BG hasn’t allowed a power-play goal in its last 19 chances, dating back to the Oct. 25 game at Clarkson. ROAD KILL: The Falcons are 6-1-1 on the road, including a 6-0-1 mark since a 3-2 loss at Miami Oct. 12 in their first road game of the season. AT OSU: BG’s win was its first at OSU since Feb. 1, 2008. The Falcons, however, did not play at OSU during the 2010-11, 2011-12 and 2012-13 seasons. DISCIPLINE: Bergeron said Friedman won’t face any supplemental discipline from the Western Collegiate Hockey Association, the result of a major penalty he received Friday night. The freshman defenseman was given a major and a game-misconduct for contact to the head as the game ended. Bergeron said the WCHA supervisor of officials Greg Shepherd reviewed the hit later Friday night and then talked with Bergeron Saturday morning. “He said what he saw wasn’t worthy of a suspension,” Bergeron said. NEXT: The Falcons host Bemidji State in a WCHA series next Friday and Saturday at the Ice Arena. Faceoff both nights is 7:07. BG is 5-1-1 in the WCHA. Bemidji is 3-7, 2-4.